What do Key Findings Mean to Sales and Marketing Leaders in Transportation and Logistics? The Health of Current Relationships with Shippers. The study shows that most shippers (91%) say that the relationships they have with their 3PLs generally have been successful. A higher number of 3PLs (98%) agree that their customer relationships generally have been successful. In addition, 89% of shippers and 98% of 3PLs agree that the use of 3PLs has contributed to improving services to the ultimate customers. Finally, 73% of 3PL users and 91% of 3PL providers agree that 3PLs provide new and innovative ways to improve logistics effectiveness. All of these factors have an impact on the overall Customer Experience (CX) provided by 3PLs to shippers. With this in mind, sales and marketing leaders would do well to focus on how to leverage sales, marketing, communications, service, and product development to maximize CX of their customers and prospects. You should also be asking how you can bring more value to the relationship to ultimately increase customer loyalty. Then make sure your sales, service, and operations teams can flawlessly execute on your core services and key offers so that the CX you offer is impeccable. Use Technology to Increase Sales and Enhance CX. According to the study, shippers are increasingly aware that if they do not have the technological capabilities to accomplish their business goals, they should partner with those that do. As the amount of available data increases, shippers and their supply chain partners will need to be able to take the information and make it relevant as many 3PLs are already making significant investments in technology that allows them to analyze shippers’ operations. Most shippers (93%) agree that IT capabilities are a necessary element of 3PL expertise, and 55% of shippers agree they are satisfied with 3PL IT capabilities. Business leaders with 3PLs, along with the sales and marketing teams, need to keep this in mind as they’re ultimately shaping their packages through product development initiatives. These days, to leverage the power of technology, most 3PLs will partner with technology innovators that provide transportation management software (TMS), warehouse management software (WMS), or enterprise-wide technology solutions. Many of these technology innovators are Affiliate members of TMSA – where you can build such partnerships. Broaden Your Value Proposition through Expanded Capabilities. This is the 23rd year this study has been conducted, and there continues to be a trend that activities most likely to be outsourced are more transactional, operational and repetitive. The most prevalent outsourced activities are domestic transportation (81%), international transportation (71%), warehousing (69%), freight forwarding (50%) and customs brokerage (40%). Sales and marketing leaders will want to make sure the value proposition of their suite of product or service offerings are centered around what they’re best at – and centered around the demand of the market. In addition, you should be asking how your company can provide added value to support your core products or services through such things as specialized reporting on a regular basis, capacity or delivery guarantees when possible, supply chain consulting or more tactical aspects such as lane analysis, etc. Do whatever you can to be the one your customer turns to when they have a pain point or challenge. Want to learn more about how to leverage sales and marketing to impact CX and the success of your transportation or logistics business? Attend the 2019 TMSA Logistics Marketing & Sales Conference June 9-12 at the Omni Amelia Island Plantation Resort near Jacksonville, Fla. The Transportation Intermediaries Association (TIA) is a supporting organization of this study and a member of TMSA. 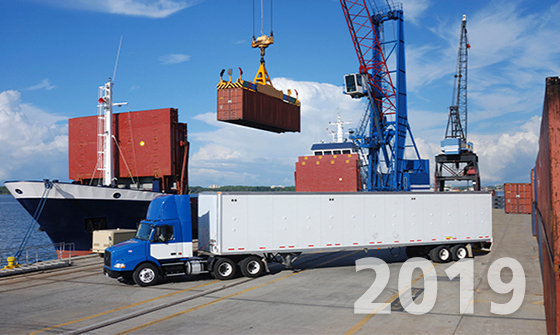 Comments on "What Shippers Need in 2019 – and How Sales & Marketing Should React"